Every month, I share a post on my series about how to stop living Paycheck to Paycheck. Budgeting is something that is learned and it is my hopes that this series will provide some great stepping stones to help people. The series will run through June of 2017 but if you want the whole book now, you can get it here. Growing up, all of my friends thought I had no money because I rarely went to the movies or bought random crap at the gas station. In fact, it was quite the opposite. I was saving my money. 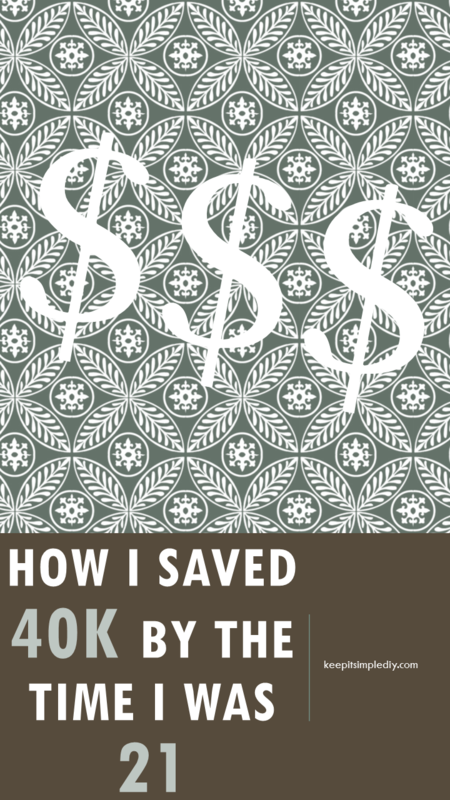 From a young age, my parents taught me the importance of saving. I remember being really young and receiving $4 per week allowance for doing simple tasks like making my bed every morning. Out of these $4, I could spend $2 and I had to put $2 into my savings account at the bank. My parents had started this account for me when I was either born or really young and it already had included a small amount of funds from gifts. As I got older and was able to do more chores, my allowance increased to $10 per week and the same rule applied. $5 could be spent and $5 had to go to the bank. Now, $5 doesn’t get you very far so I also had to save the spending money in order to get something from the store. Over and over again, I would save up and by the time I would have enough money, I either didn’t want the item any more or I had saved so long that I didn’t want to see the money go. So, most of my spending money ended up in the bank. When I was 12, I started babysitting. This is when I really started saving. My first year of babysitting I was making $3/hr watching one child or $5/hr for two children. The first year of babysitting I made a little under $1000, all of which I put into the bank. I continued babysitting and saving until the kiddos I babysat were old enough to stay home alone. This was around when I was 19 years old. My fees had gone up to $10/hr for one child and I didn’t have any jobs with two children at that point. In addition to babysitting, throughout high school, I worked the concession stands during the games, helped out my neighbor in her dental office, and got my first job in a retail store. I also helped neighbors with house-sitting or other house projects like painting. I remember one day when I was around 16 where I had three babysitting gigs in one day. I worked from about 9am to 9pm with only enough time to go from one house to another between. As much work as it was, it was so rewarding! When I was 18, I landed a job that paid very well considering I didn’t have a degree. This job was fun and flexible around my school schedule. I stayed with this job for two and a half years. I lived at home until I was 21 even though some days I thought it was going to kill me. I definitely had the fear of being the boomerang kid who moves out too early and can’t make it on their own. So, I made damn sure I was going to be successful when I finally did move out. The entire time I lived at my parents, I saved all of the money I earned. When I was ready to move out, I started looking for a home to buy. I knew I never wanted to rent an apartment. Of course though, that purchase fell through and I ended up having to rent. Anyways, good thing I had extra money saved up to put towards rent right? I always knew that there were going to be large purchases ahead and that by the time I turn 28 that I would have definitely need a new car. I knew that I was also going to buy a house. This is what kept me motivated to save and kept me from buying novelties. I will be turning 28 in April of 2017 and am very happy that I saved early on. I am now able to sell my house and purchase house #2 where I will start my family. While not everybody may be able to live at home until they are 21, there is always a way to better your situation. Saving money towards a larger goal or saying goodbye to living paycheck to paycheck requires the motivation to work hard to have a better future. This is such a great story! I’m 21 now so this is definitely an eye opener and helpful for saving going forward. Wow – that’s awesome! My parents always taught me the importance of saving too! I think that’s an important lesson to teach a child. To this day, I still feel uneasy making large purchases – even when they’re necessary, haha! 🙂 Thanks for sharing this! This is so inspiring! Some people with jobs even struggle to grow their savings. It is all about planning and self-control if you want to achieve your financial goals! omg wow! It has definitely paid off. Good for you!! Your parents taught you an invaluable lesson. I am going to use these tactics once my husband and I have kids! That’s amazing! Congrats on saving so much! Wow! I’m so impressed. You sound like a natural saver. Wow! Great job saving throughout your life! Such a great story – very inspiring! Great job and good for your parents for teaching you these great habits early on in life. Thanks! I plan to do the same for my future kids!